How many times do I need to see Dr. Belt? Dr Belt will see you personally for one or two consultations prior to performing any surgical procedure. Each consultation will last approximately thirty minutes. You are welcome to attend more consultations if you need more time or information before deciding on your operation. Usually two consultations are required for cosmetic and aesthetic procedures, or for complex reconstructive cases. How much does it cost to see Dr. Belt? The fee for the first consultation is $180.00. If you have a GP’s referral you will receive $72.25 back from Medicare. If you do not have a GP referral, you may still be eligible for a rebate of $21 or $38. Second consultations (if required) may or may not incur a $90 fee ($36.55 rebate if you have a valid referral, $21 or $38 without a referral) or may be bulk billed. You will be advised at the time of your initial consultation if this is the case. Usually only longer and more complex second consultations will incur a gap fee over the Medicare rebate. The fee for a consultation for breast augmentation is $160.00. There is no second consultation fee for this procedure. Rebates may not be available for certain purely cosmetic procedures. 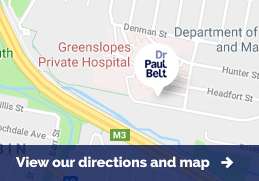 Please contact Dr Belt's rooms on 07 3852 6800, if you would like clarification. Are There Any Costs for a Follow-up? For all of the straightforward procedures all of the post operative follow-up costs are included in the original surgeon’s fee. For continued surveillance of significant skin malignancies (e.g. melanoma and squamous cell carcinomas (SCCs) of the lips a fee will be charged for follow-up which may be necessary for up to a period of five years. The standard fee is $90 of which $36.55 is rebatable through Medicare with a valid referral.